Associate membership of the Association of Professional Mole Catchers is applicable mainly to commercial mole catchers and to individuals involved commercially in pest control or wildlife control, etc., and who occupationally are engaged also in mole catching. employed (or self employed) persons engaged in gamekeeping, grounds maintenance, farming, etc., and who through their main occupation engage also in mole control using mole 'kill' traps. Associate Membership of APMC offers several advantages to occupational mole catchers. APMC's purpose in offering Associate Membership is to accommodate formal connections with occupational mole catchers who for whatever reason might fall outside the Association's criteria for Full Membership as a Professional Mole Catcher. 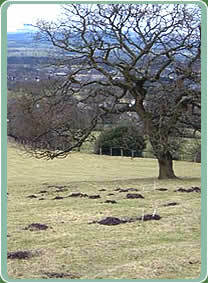 Many individuals trading as general pest controllers, and others trading as wildlife controllers, might also offer mole catching as part of a compendium of services. APMC accepts happily that any experienced mole catcher might be as capable and competent as any other regardless of how individuals choose to describe themselves. APMC believes it is important however to maintain the identity of mole catching as a distinct and identifiable professional discipline, and which in the main part is why APMC offers Associate membership as an alternative provision for mole catchers.